Until last weekend, the bridge section running over Irving Park Road, (which is a main artery for transporting freight to and from O'Hare International Airport), had been resting on temporary piers and trucks could pass underneath. Then on the weekend, the bridge was placed on its permanent piers and the new 12-foot-6-inch clearance was no longer high enough for semi-trailers to clear it. 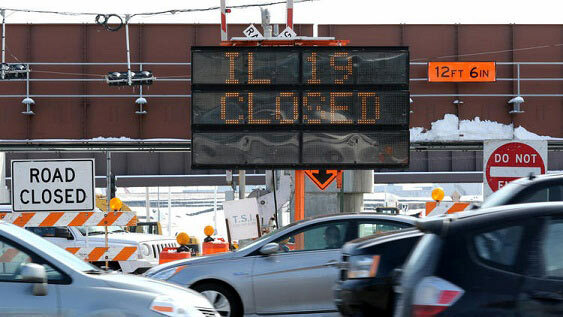 Although the Illinois Department of Transportation claims to have posted plenty of detour signs giving truck drivers fair warning, city administrators had sat down with IDOT last week expressing their concerns. "None of us felt real confident the detour signs would be obeyed,” Bensenville Assistant Village Manager DaDi Santo said. However, IDOT spokesperson Carson Quinn maintained that they did everything to prevent such a disaster from happening and that truck drivers simply ignored the signs. "IDOT had hundreds of signs in the area warning trucks and directing them accordingly, so the number of signs was not an issue. These signs were installed for some time," Quinn said. Within the first few hours of the bridge re-opening, three semi-trailers crashed right into the overhanging structure and a total of 15 collisions occurred on the busy street within the first day, with most of them involving trucks over 13 feet high. In one case, a truck was stuck under the bridge as a freight train approached. Fortunately, the train was going slow enough that it was able to divert in time. Village President Frank Soto said that the way the road is engineered led to a perfect storm and that the traffic leaving O'Hare turns onto Irving Park from Route 45. "Once they turn off route 45 -- they're stuck. The way it's configured, there's no turnaround," Soto said. "It wasn't a question of if, it was a question of when. We just didn't think it would happen the first day," he added. The best news is that no fatalities or serious injuries occurred in any of the collisions, but there is the serious inconvenience of Irving Park Road being closed for the next four months while reconstruction is completed. Officials say that trucks will again be able to pass under the bridge once it re-opens. Are signs enough to warn truck drivers already enroute to bridges or low clearance structures? NO.....signs AFTER being in a situation where there is no "escape" is no help at all......the only alternative is to shut the truck down until "someone" can stop traffic for a turnaround and we ALL know what would be happening THEN ! We just had a bridge collapse here in Tx on I-35 about 40 north of austin, Tx due to a truck that was too tall hitting a beam and taking out the bridge. It's blocking both sides of the highway and there is a truck and other vehicles damaged and trapped from what the news is saying. Yeah. State road 19. Usually state roads are pretty safe for bridges. However. Not in Chicagoland. Lmao. What a dumb dumb move on the city's part for allowing this. You can CLEARLY SEE a 12-6 bridge is to low for a 13-6 truck......WHILE sitting in your truck driving. If you can not judge this height difference you shouldn't be driving. (A couple inches is one thing....however a whole foot or more is another) Good rule of thumb folks....if your antennas rub the bridge, then your van sure isn't going to make it under. This rests, squarely, on the drivers shoulders. The city, state, or what ever put out an abundance of warning signs. The drivers were too stupid, to read the signs. That is no fault of the municipality. That is one of the reasons, we have so much regulation in this industry. The government feels as if it needs to protect the motoring public as well as the drivers, from their own stupidity. LEARN TO READ, OR GO FLIP BURGERS, we DO NOT need idiots out here!!!!!!! Many times, over the last 23 yrs.. You can hit bridge quick, if you are NOT paying attention. Wow bad drivers hurting good drivers. What is the going rate for hauling a bridge? The problem is nobody wants a truck to stop and back up, no officers are ever present to assist drivers making a wrong turn, and many low bridges have no turn around for large trucks that do end up looking at the low clearance. Bridges that are not high enough to clear trucks need to have last minute alternatives for detouring. Sometimes signs are not posted to be visible until after you have committed to the route, and no choices are left once the turn is made. (Although these drivers should have stopped before making contact with the structure, ending up on the route may not have been avoidable, as I have ended up on routes I would have tried to avoid if not for traffic "herding" me into it) if I were king for a day, I would insist any and all structures be raised to statutory heights for safe and effective passage. If you read the article the city knew this would happen. All knew bridges should be 13'7+ just for breathing room. Does Anyone I Mean Does Anyone else SEE A SIGN That Says 12' 6" Anywhere in this Picture! !